Art Placement offers a range of cleaning products specific to the needs of artists. 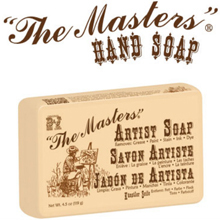 B&J® Original Formula “The Masters”® Artist Hand Soap cleans gently cleans hands of oil and acrylic paint, stains, grease, inks, and more. Keeps hands soft with a refreshing spearmint scent. “The Masters”®Hand Soap is specially formulated to remove petroleum-based paint or materials without harsh and messy thinners. It removes dried-on paint with just water. It's non-abrasive, and leaves hands soft. Use it in the art room and for other dirty tasks around the house. 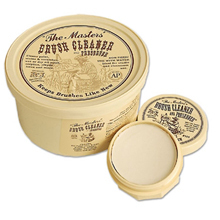 “The Masters”® conditions as it cleans and contains no lanolin. 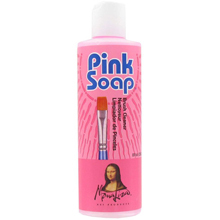 Mona Lisa Pink Soap is designed for cleaning artist brushes. Soak bristles in Mona Lisa Pink Soap™ and work excess paint from bristles, then rinse off. After cleaning, leave a small amount in the bristles to condition, and rinse before use. This multipurpose product is also helpful in removing oily, greasy stains from hands, clothing, furniture, carpets, etc. Pink Soap also removes odors (onions, garlic, fish) from hands and clothing. Contains no alkalis, phosphates, solvents or alcohol. 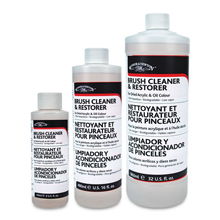 Winsor & Newton Brush Cleaner and Restorer completely cleans dried acrylics, oils, and alkyds with no damage to the brush head or loss of fibers. It can be used on natural or synthetic brushes. The cleaning solution is effective within minutes for oil colors (hours for dried acrylics), and leaves no oil residue. This water soluble cleaner is non-toxic, biodegradable, non-flammable, and has low vapor. It comes in a plastic bottle.